Should you renew your tenant? Can Your Tenant Continue to Satisfy the Obligations of Their Lease? During the course of a lease, a tenant’s financial situation often changes. As such, making certain that you are aware of what those changes are prior to renewing the lease is important. Even when a tenant has been reliable to date, the landlord is often unaware of developing financial issues or changes to corporate structure. What could have changed since the original lease? Approaching your renewals like you would your prospective tenants, with increased due diligence, will protect your investment. 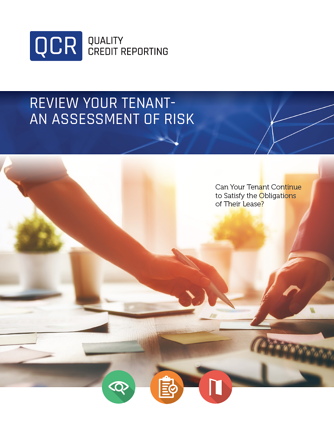 The Quality Credit Reporting Renewal Report will give you the fresh information you need to keep up-to-date on your tenants while also avoiding a potentially uncomfortable situation between the landlord and a longtime tenant. Our original credit application, completed by the tenant, includes a clause which authorizes Quality Credit Reporting to gather subsequent credit data through the duration of the lease.